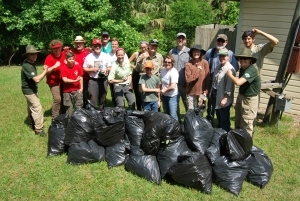 Join us for National Public Lands Day to help restore native habitat at Paynes Prairie. Please RSVP so that we can plan accordingly and contact you with any changes if needed. 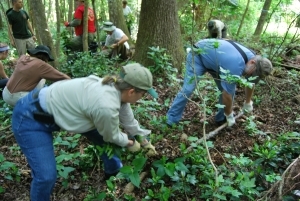 Help remove an exotic invasive plant called Coral Ardisia from native habitat in the park. We will be removing plants by hand, and no herbicides or chemicals will be used during this event. We will meet in the parking lot, where you can park your vehicle for the duration of the event, but we may be working in another location of the park. We will transport everyone together to and from the worksite on a park tram if needed. Restrooms are available at the Visitor Center parking area, but may not be available at the work site. Please dress for work in muddy conditions in an off-trail environment. Wear closed-toe shoes that you don't mind getting dirty, and long pants or sleeves for protection from insects and vegetation. Work gloves are recommended. Bug spray and trash bags will be provided. We will have an igloo of water to refill water bottles, but in an effort to conserve use of disposable products and reduce waste, we ask that you please bring a reusable water bottle or alternate drinking vessel if possible. Park admission fees are waived for participants in this event. Directions: Enter the park at the main entrance in Micanopy off US 441. Stop at the Ranger Station and let them know you are here for the event. You will drive to the end of the park drive, Savannah Blvd, and park in the circular parking lot at the end of the road. This is the parking lot for the Visitor Center. You may ask the staff at the Ranger Station for a map or directions to this location. If you have any questions, you may call the Ranger Station at 352-466-3397.